Has the apartment been independently assessed as five-star accommodation? Yes. You can check quality ratings and even read the inspector’s report for yourself at www.qualityintourism.com – just enter the postcode: GL50 1LR. Quality in Tourism is the assessment service for Visit England – the UK’s largest rating service. Yes. 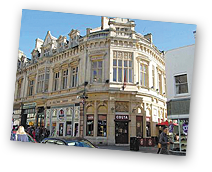 The minimum stay in our luxury Cheltenham apartment is two nights. Is there parking at the apartment? Yes. The apartment has its own free private parking space immediately outside, secured by a parking post that’s locked and unlocked using your room key. Yes, linen and towels are both included in the cost of your stay. For further details see our full inventory. And before you ask – yes, there is a hair dryer! A good one too. We do! Your welcome pack includes a pint of semi-skimmed milk, six large eggs, butter, bread and a cream tea (scones, jam and clotted cream). You’ll also find salt, pepper, tea bags and instant coffee in the kitchen. Sorry, but no pets are allowed in the apartment. The apartment has one bedroom only and is designed for adults. It is illegal to smoke in the apartment or the common areas. Anyone found smoking indoors will be fined £100. Are there good walks in the area? Yes! 24 The Promenade is a great base if you’re into walking. The Cotswold Way, Leckhampton Hill and Crickley Hill Country Park all have great walks with great views over Cheltenham. There are walking guides in the apartment. Is the apartment suitable for disabled guests? Like many Regency properties, there’s no lift in the building, but I will do my best to help you. Our access statement contains door dimensions and details of stairs, etc, but if you’ve read this and still have questions, feel free to call or email. Is the apartment easy to find? Yes – provided you enter GL50 1HQ into your sat nav or maps app on your phone, and not the apartment postcode (which takes you to the wrong side of the building). You’ll find more details and a downloadable map on our How to find us page, and we’ll email detailed directions when you book. Will I be greeted on arrival? Yes! I’ll be there to meet you, help with your luggage, and show you around. Marks & Spencer is just 100 yards away, Sainsbury’s – which is open 7am to 11pm – is around 300 yards away, and Waitrose is a little further. I see the apartment is above Costa. Does it smell of coffee? Is it noisy? No and no! Though the apartment is very central, it’s also very quiet. There’s no noise – or coffee smell – from the Costa below. You can check availability and book here. It depends when you book. We require £200 deposit to secure your booking, with the remainder due six weeks before arrival. If you book within six weeks of your stay, you’ll need to pay in full at the time of booking. Of course, you may prefer to pay in full whenever you book – and you have this option when you get to the payment section. Early payment doesn’t affect your rights. You can pay for your stay by credit or debit card, or by PayPal. We don’t accept payment by American Express, Diners Club or cheque. Overseas guests can choose their currency when paying by card. Can I get to the apartment by public transport? You can. Our How to find us page [link] contains full details of how to get to the apartment by bus, train or taxi. I’m attending one of your perfumery courses. Do I get a discount on accommodation? You certainly do. We offer £50 discount per night for anyone booking 24 The Promenade and attending one of our perfumery courses. I can even drive you to Bourton-on-the-Water in the morning and back at the end of the day.